National Women's History Museum CEO Joan Wages asks members of the museum's board to raise their hands at a reception at the Capitol, celebrating the passage of legislation in Congress. The National Women’s History Museum is not an architectural marvel with ornate ceilings and Corinthian columns. In fact, the museum hasn’t been built yet. The nonprofit organization looking to make that happen is housed in an office building off I-395, a 20-minute drive from the spot on the National Mall it hopes will become a construction site. Last month, President and Chief Executive Officer Joan Wages celebrated a victory in the battle she’s fought for two decades: Congress, which must approve projects on the Mall, will form an eight-person committee to explore the construction of a National Women’s History Museum comparable to the Smithsonian Institution’s museums. “It’s important to have a [physical] space just about women’s history so that people can come in and be overwhelmed by all the women’s history that they did not know,” Wages said. Legislation similar to the one that passed in December has been introduced during every congressional session since 1999, always passing in either the House or the Senate, but never both. “It’s been a real struggle to be a-political in a very political climate,” said Bonnie Morris, an adjunct professor in the women’s studies department and a scholarly adviser to the National Women’s History Museum. Katrin Schultheiss, an associate professor of history at GW, said she saw an opportunity to bring the nonprofit and GW together in 2013 in the form of a speaker series. The museum co-sponsors four forums that are free to students each year about women in the military, sports and science, technology, engineering and mathematics fields. “GW students are so politically involved and interested in public policy [that] this is something that feels like a natural fit with the student body,” Schultheiss said. The museum’s cause has become a part of women’s history itself. The journey has been wrought with debates that have held back the passage of a bill ensuring Congress will consider building the museum. As Congress split hairs over the budget in December, supporters attached the exploratory measure to a defense spending bill. If the committee approves construction of the museum, the House and Senate will put it to a vote. Schultheiss, Morris and Wages hesitated to express anything other than reserved hope. “Most people are apathetic or just unwilling to give [the bill] the kind of political push it needs,” Schultheiss said. But they will at least avoid arguments about taxpayer dollars. The project is privately funded: The National Women’s History Museum has more than 50,000 charter members, who make donations of $35 or more upon joining. The group also holds events that bring in individual and corporate sponsorships, as well as privately sourced grants. In 2010, actress Meryl Streep donated $1 million to the project. “The legislation makes it clear that this won’t cost taxpayers a dime, now or ever. No other bill for a museum has been written like this,” said Susan Murphy, the National Women’s History Museum’s director of communications. Despite the legislative hurdles, the organization has come a long way since it formed 20 years ago. “We literally started around a kitchen table,” Wages said. In 1996, despite a unanimous Senate vote to move a portrait monument of Elizabeth Cady Stanton, Susan B. Anthony and Lucretia Mott from the Capitol basement back to the Rotunda for the 75th anniversary of women’s suffrage, the proposal collected dust on then-House Speaker Newt Gingrich’s desk. The statue was first unveiled in the Rotunda on Feb. 15, 1921. The next day, Congress had it moved to the basement, where it remained for most of the 20th century, Wages said. Wages said this project was a “metaphor” of a nation often forgetful and neglectful of women’s history. “It comes to the light [and then] it’s hidden in the crypt, the library or the archives. Women’s history never becomes part of our national story,” Wages said. At a reception celebrating the congressional nudge forward for the museum, Rep. Carolyn Maloney, D-NY, spoke to a large group of mostly women, including many senators and former representatives, popping bottles of champagne and clinking glasses. “I thought building a women’s museum would be like having a cup of coffee in the morning, everyone would agree on it. 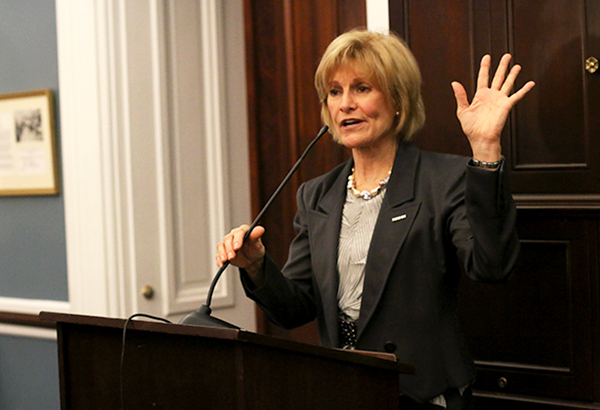 But it was so hard, it was beyond belief,” Maloney said during her speech. Gail Collins wrote a New York Times op-ed in which she described the seemingly undemocratic process of passing bills in the Senate in September 2010. At the time, it had been unanimously passed in its Senate committee, the House and had 23 bipartisan co-sponsors – but Senators Jim DeMint, R-S.C., and Tom Coburn, R-Okla., put holds on the bill. “A hold is one of those quaint Senate traditions that ensures that each individual member of the chamber will have the power to bring all activity to a screeching and permanent halt,” Collins wrote. “And to that we respond, if that’s all you know about women’s history, that’s the reason we need this museum,” Wages said.